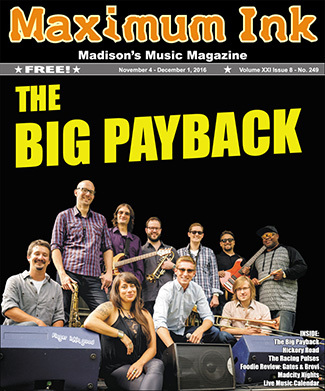 The Big Payback is about to unleash a brand new bag of jazz-rock brass-laced funk on Madison’s music scene. Five years after their debut album “Overture” took audiences by storm, The Big Payback is releasing a new album entitled “Animal Brain” on November 18th. And, with the talent and projects compiled in the 9-piece musical powerhouse, recording it was no small feat. Fronted by the spicy soulful vocals of Leah Isabel Tirado, TBP is compromised of highly experienced and profoundly innovative artists whose collective sound has earned them award after award after award. Guitarist Kyle Rightley took time out this week to talk with me about “Animal Brain” and how the theme of musically unifying the duality of the human mind came to fruition. MI: It’s been five years since TBPs debut album was released, and the members of the band, yourself included, are involved in many projects. How long did it take TBP to write and record Animal Brain? Kyle Rightly: The first song written for the album dates back to 2010, the year we recorded our first album, Overture. That album was a collaborative effort in that multiple band members brought song ideas to the table, and we worked on them together. But the busier we got as a band and as individuals, the less that approach worked for us. I started learning how to write my own songs and chart them out for the whole band, and so I became the primary songwriter. I didn’t intend for that to happen, but I saw that there was a role to fill and so I stepped up to the plate as best I could. When I had written a full album’s worth of material, it felt right to get back into the studio. We started recording Animal Brain in August 2015. We were pretty meticulous with how we wanted the album to sound and look, so we took our time. Plus we had to juggle the busy schedules of nine professional musicians and one highly sought-after recording engineer. We’re lucky enough in this band to work with some of the most talented people in town, but it does present a scheduling challenge when your sax player is playing in Europe and your bass player can’t make it to a session because his other band’s van broke down in the middle of a tour! MI: I noticed that Animal Brain’s playlist includes songs entitled Animal Brain, Animal Brain II and Animal Brain III. I’m curious, are these different versions of the same song, or does this tie in to a larger concept? KR: The title Animal Brain comes from an instrumental song I wrote for our 2014 appearance at Jazz at 5. That song consists of a few very distinct segments, and it made sense to break it up and mess with it for the album. So the three short “Animal Brain” songs are three different takes on the same musical idea. They function as connecting pieces to help the music flow. They also tie into a theme that underlies that whole album- that our brains have a more developed, human side as well as more instinctive, animal side. The first half of the album deals with love, relationships, politics, and other things that we think of as “human.” The second half of the album deals with more primitive and instinctual emotions. It’s two parts of the same whole. Spreading the “Animal Brain” tracks throughout the album helped us unify the concept. MI: Madison loves TBP as evidenced by your sold out shows and multiple awards. You’re known for being a funk/R&B group. What kind of sounds can we expect on your latest album Animal Brain? KR: The new record is very eclectic. In some ways, it has more of a rock feel than our first one, thanks in part to the one cover song, Jimi Hendrix’s “Crosstown Traffic.” But there’s also some really upbeat pop, some soul, some jazz elements, and even this theatrical, vaudeville-like vibe on the song “Greenblood.” For me, it’s Leah’s voice and the horn section that ties the record together. Even with all the different styles mixed in, it’s that powerful lead vocal and those sizzling horns that make it the Payback. MI: I read that your band or members of your band contribute to Master level courses in music. Can you tell me more about that? KR: We’re a pretty educated band, musically speaking. A lot of us have music degrees, and I think three of us even have Masters degrees in music. Everyone in the band makes some of their living as a music teacher. Because of that, we have a lot of opportunities to do some really cool educational things. We have done masterclasses, workshops, and collaborative concerts at middle schools, high schools, and universities around Wisconsin. It’s a really special thing to be able to spread your love of music like that! MI: The cover of the Animal Brain album is brilliant! Who designed it and who all collaborated on the design concept? KR: Thanks! The credit goes to Katie Hess. She’s an artist and musician- she plays with me in the band Beefus. Her work tends to feature a lot of organic, animal-like shapes, and I thought she’d be a good fit for Animal Brain. I had a very general idea of the artwork in my head, but I wanted her to have creative freedom as well. I pitched her the concept and gave her some rough mixes of the songs, and she was really into the project. She would send initial ideas, and Jamie and I would offer our thoughts and point her in a direction that would fit the band. Ultimately, we ended up with something that I think we’re all really happy with. I love collaborating with creative people like that- you get into territory you’d never be in working just by yourself. The mixing process was also very much like that. Jamie, Landon, and I worked together to get something we all liked. MI: What is one thing you’d like your audience to know about TBP that they haven’t read anywhere else? KR: Some people think of us as a cover band. We’re not! Maybe it’s because our name is from a James Brown song. Yes, we play covers as well. But we now have two albums worth of Payback originals that we love playing. If you’re going to hire us to play only covers, the price better be right! The “Animal Brain” CD release party will be Friday November 18th at the Knuckle Down Saloon in Madison, Wisconsin from 9pm until 12:30am, with special guest Steez.